Yesterday we looked at the lens, screen and viewfinder on the Olympus Evolt E-410 Digital SLR Camera. First off, we have to say that we loved the size of the camera. Although it’s by no means pocketable, the skinny shape meant that we were more inclined to grab the E-410 instead of a digital compact, and the minimal weight meant that it wasn’t a burden to shunt about all day. Despite the camera demanding to do its supersonic sensor cleaning shuffle every time it turned on, in practice, the camera was ready more or less instantly, although not quite as fast as, say, the Nikon D40x. 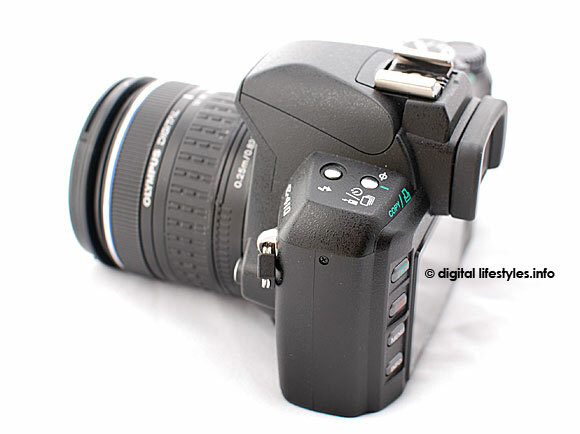 The Olympus’s overall performance was pretty good, with the camera focussing relatively speedily with a short shutter lag and fast buffering rates giving good continuous drive rates. We managed to rattle off over 3 frames a second for 9 frames in RAW mode and completed a burst of 16 consecutive shots in full-size Super High Quality JPEG mode before the camera paused for breath. Impressive stuff. 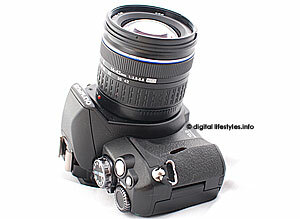 (Tested with a 1GB Ultra II SanDisk CF card). We found the E-410’s interface to be pretty much intuitive, with a clean, logical layout and well organised sub menus. Even without the manual, we rarely found ourselves stuck for long. For exposure-meddling types, there’s controls for image sharpening, contrast and colour saturation parameters, each offering five levels of adjustment. What we didn’t like was the fact that we couldn’t zoom straight into a picture when shooting, or delete it without switching to the play mode first. A minor inconvenience, but one that got a bit annoying after a while. 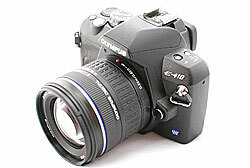 One of the main attractions of the E-410 is the Live View Mode, which although remains fun and a definite improvement on its E-330 predecessor, it’s still not quite as refined as it might be. Pressing the Display button on the rear of the camera activates the live view, accompanied by a noticeable clunk as the mirror flips up. 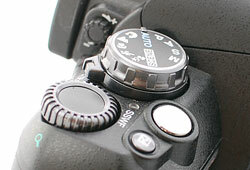 To use auto focus, the camera has to close the shutter and drop the mirror to access the AF sensor, resulting in a darkened LCD display. Focus speeds in this mode were variable – pretty nippy in good light and sometimes painfully slow in low light (anything up to 3 seconds – and sometimes it failed to focus at all). 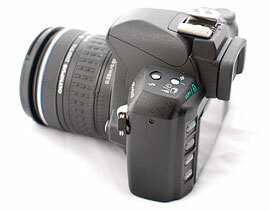 In manual focus, it’s possible to zoom into a part of the live image up to 10x to check focus, and using Live View you get to see an exact representation of focus point and depth of field on the LCD screen, which is useful. Despite its shortcomings, we grew to like the Live View Mode very much and found ourselves missing it when we returned to our usual Nikon D80. Low light performance was the one thing that disappointed us about the Olympus. Cursed with no AF focus lamp, the camera is forced to pop up its wee flashgun and blast the night sly with a strobe pulse. Even with the blinding strobe bursts, the E-410 could take some time to focus, leaving the subjects feeling like they’d just survived a new interrogation technique. And anyone looking to discretely capture wildlife scuttling around the bush at night can dream on. With the camera’s intense strobing drawing comparisons with a drum’n’bass dancefloor, the only thing you’re likely to attract are curious moths, confused ravers and perhaps a passing Morse Code enthusiast or two. Look out for Part Four on Monday.